UPDATE-Mena NOAA Weahter Radio is back on the air as of Monday afternoon, October 29th. 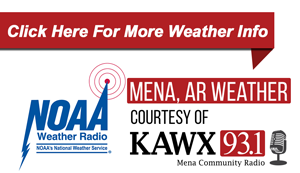 Mena's NOAA Weather Radio Station (KXI97 162.400 MHz) is currently off the air while a new generator is being installed to operate the station when commercial power is not available. Due to the remote location of the transmitter southeast of Mena, the backup power generator will enable the National Weather Service to continue operating and informing area residents for extended periods of time, even without commercial power, which hapapens at times after storms. The down time is not expected to be long. While this work is being performed, Mena area residents might want to set their NOAA Weather Radio to the Mount Ida NOAA Weather Radio station that operates on 162.425 MHz.